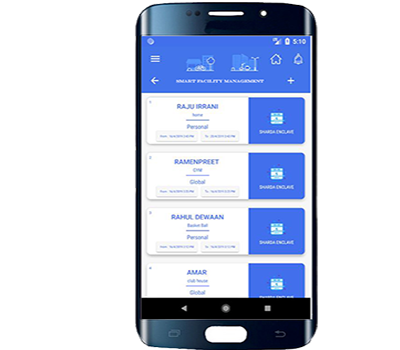 UloApp integrates various dimensions of managing a residential complex such as managing finances, managing data (of owners, facilities, assets, documents etc. ), managing day-to-day operations, and most importantly bringing the entire community together. 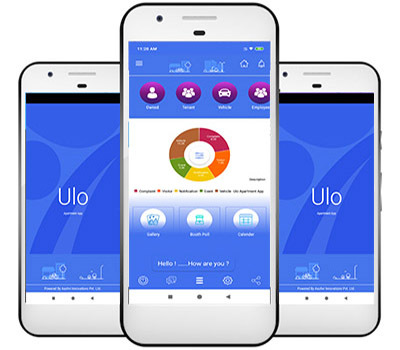 UloApp is offered as a hosted solution with zero infrastructure setup by the society. We are driven by customer experiences and want to be ready with the options that suits their needs. Get instant extended services like Accounting Support, Billing Management, Parking Management any many more. We provides 24/7 web-based access. 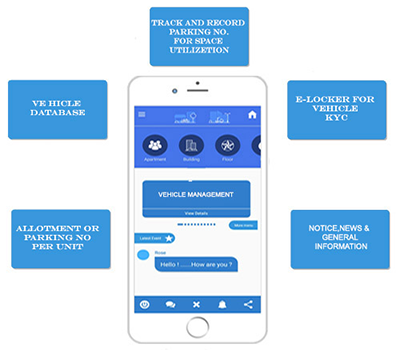 There are features in which general and specific notices can be sent to society member which makes communication very efficient. It's built on super awesome Flat UI which makes the app look beautiful & responsive. Uloapp provides you the platform and tools to bring all residents together to build a happy community. Maintain details on all flats/units in a particular tower or blocks. Keep all data of the owners for each flat/units This will help in one click info of all flats. All documents related to flats: Any kind of docs like lease papers, owner details, rent agreements, etc that are related to flat can be kept as scanned docs for access from anywhere any time. Access to admin for allocating owner or tenant as active staying or not. Cloud access to society information make it secure. That's all mentioning details of vehicles they have travelled with. Batch report print for utility. Used in cases where Members are billed , typically for Piped Gas, Water, Electricity, Diesel Generator etc. 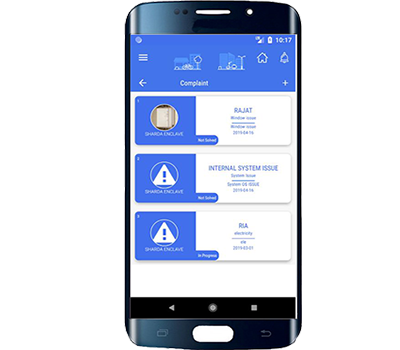 Utility Bills are represented separately from Maintenance Bills - so Tenants can pay Utility Bills, Owners can pay Maintenance Bills through Uloapp. Also Utility Dues are not mixed up with Maintenance Bills - so the Arrears shown in each of the Maintenance bills are independent of Utility Bills and vice versa. Pull up a list of Utility Defaulters and alert them through Email or SMS. Facility to Upload Late Payment Interest, Usage charges - additional Revenue for Society. Auto-update of online payment made by the resident into the software against the bill Print open invoices and receipts in batch. Filter defaulters. Late Payment Interest/Fine can be automated in a single click. Supports different societies/apartment Categories and set charges differently. Automatic Invoice generation against each flat/units for regular, fixed charges - e.g.Maintenance Fee. Easy posting of amount collected, with generation of e-receipt which can be sent by notifications,email, sms or print. Distribute a payment among invoices generated or automatically assign the payments on FIFO principle. Post Dated Cheques can be tracked easily. Financial details against each flats viewed with ease, with color coded lights to identify defaulters. Notifications/Email/SMS reminder can be sent to payment defaulters, with amount specific to each defaulter over certain period. Easy setup and tracking of Direct and Indirect Expense Heads. Selection of Petty Cash / Bank Accounts while posting Expenses. Printable vouchers/challans generated for every payment posted. Outstanding dues against Vendors is available. Multiple Invoices against a Vendor can be posted. Configure Bank Accounts and Petty Cash. 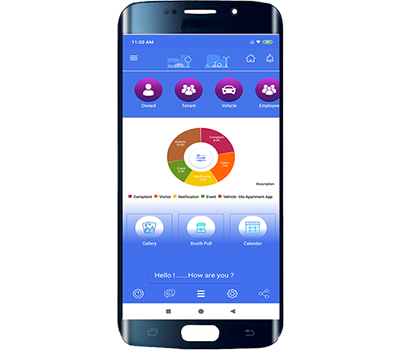 Seamlessly integrated with Income Tracker and Expense Tracker - all income and expenses posted reflect against Bank Accounts or Petty Cash. Transfer between accounts, withdrawal to Petty Cash can be captured. Makes Bank reconciliation very easy. Export the above transactions to Excel and import them to tally if needed. Accounts to configure Assets, Liabilities, Income and Expense Account Heads all in one place. Journal Entries to move money to relevant Account Heads. Journal Entries to capture asset depreciation, bank charges and loans etc. Free flow query to pull up transactions from any date and any account. Complete accounting functionality - from defining a chart of accounts to the generation of the final balance sheet. Individual sub-ledgers for all Units (Flats/Villas) and Vendors. Flat-wise account statements and vendor-wise account statements. Advanced functionality such as Adjustments (Journal Entries) to credit/debit to relevant Account Heads and Sub-ledgers. financial reports available for view/ download. 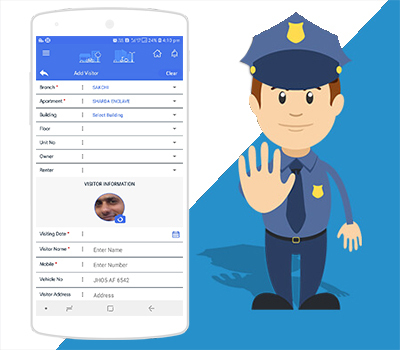 Generate Visitor Pass by filling up the mandatory details like Name and other details of visitor,Whom to visit,Purpose,Time in/out,photos,visitor code etc. Residents can update "Expected Visitor and Pre-approved" details. Security personnel shall automatically know about the Expected and Pre-approved Visitor. Visitor shall receive an immediate OTP for hassle-free entry into the society. Reduced work for Security personnel and Hassle-free experience. Track and Record the visitors. Record details (including photo) of visitors. Mobile OTP send to visitor mobile for verification at the security gate. Mobile Notification sent to Resident/Host for Approval for approval or deny. Security personnel falls back to manual verification if no response is received. Offer web and app based booking facility to all residents holders and admin. Set terms and conditions of booking for Community Hall,Club House,Gym,Swimming Pool,Basket Ball Court etc. Right administrator control to accept/reject a booking. Automatically generate an invoice on resident app. Comprehensive reports on availability,booking,revenue and usage. Online Complaint Functions for Residents and Admin. Raise complaints about own flat or common areas or on behalf of resident holders. Full accessibility and visibility of the progress of complaint. Forward the concerned complaint to the authorized department or to the personnel. Provide rating and reviews on complain performance. Upload /Capture of complain and description. Get important contact details of employee working in society (Example-Electrician,Security, Plumber etc). 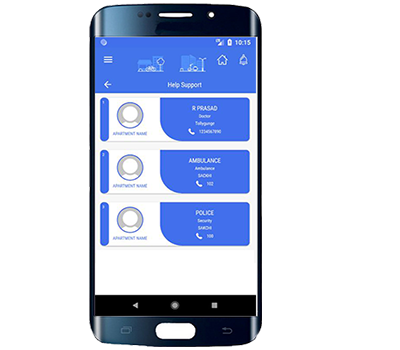 Get important contact details of locality or city or state (Example- Police,Hospitals,Ambulance,Fire brigade ,Restaurants,Salons and Spa,Garage,Car washing,Hotels and other). Create help desk by category/images and description. Get quick and efficient connect through mobile. "Its an efficient apartment management software that prove be quite easy going in operating day to day activities of our apartment complex. It helps in managing all expenses,income and dues details, the inter apartment chart system is very smooth and easy." Santosh, with his young and energetic personal, handles the Business Development Team at ULO. He understands the market and customers demand from the ground level. AMIT, with his young and energetic personal, handles the Business Development Team at ULO. He understands the market and customers demand from the ground level. HARPREET, with his young and energetic personal, handles the Business Development Team at ULO. He understands the market and customers. Now all your society problems, worries and affairs are our responsibilities at AMS With the help of our experienced team at AASHVI INNOVATIONS PVT LTD.
© Copyright 2018 AASHVI INNOVATIONS PVT LTD. All rights reserved. Leave your details here for a Product Demo.